Comfreys (of which there are several growing in the UK and Ireland) are a confusing group of plants because they readily hybridise with each other producing flowers varying from white, through pale pink and mauve to dark purple. 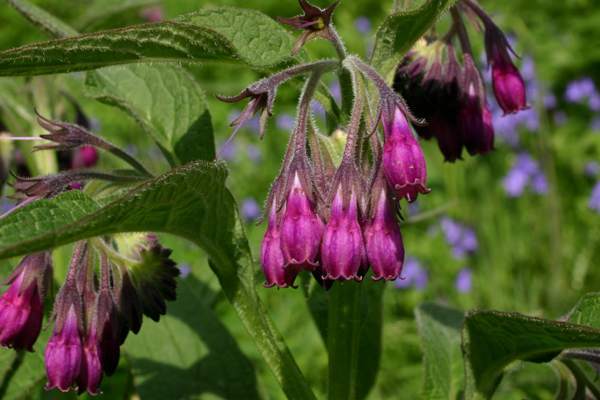 The very dark purple ones are commonly referred to as Russian Comfrey - Symphytum x uplandicum. These perennial plants love riverbanks and damp hedgerows. The flowers appear in May and June, often making lovely displays with Bluebells and other early spring flowers. 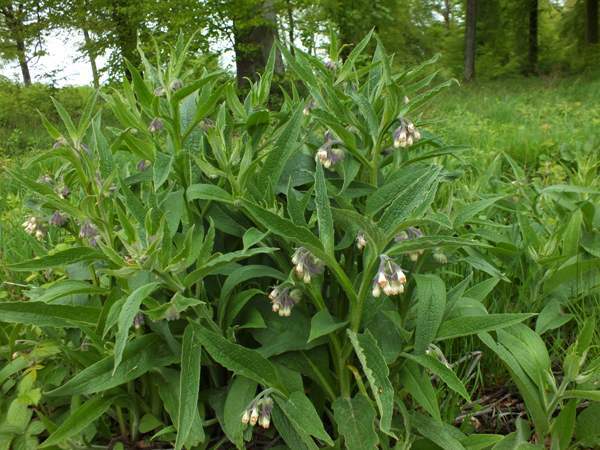 At one time, comfrey leaves were used as dressings for cuts, bruises and broken bones, although in the latter case it was the roots of the plant that were combined with other substances and used as a kind of latter-day plaster of Paris. 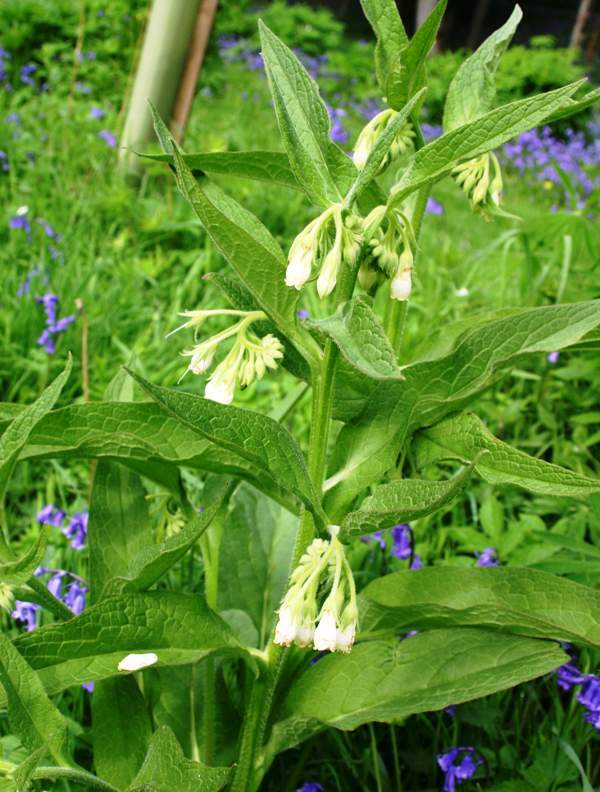 There are many comfrey species, some of which have creamy-white flowers (see the example below); identifying them to species level is a task for experts!. 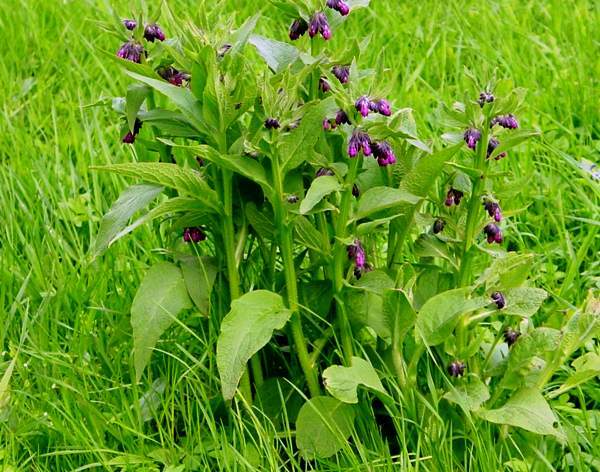 Infusions of the plants were used in the treatment of gastric ulcers and other stomach complaints although today this concentrated form of comfrey is discouraged because of the levels of liver-damaging alkaloids to be found in these mixtures. Comfrey leaves are still used for culinary purposes and the leaves eaten in salads although small quantities are recommended. Comfreys were first introduced to the UK as a fodder plant and have since become naturalised. Today they are used mainly as a type of green fertiliser. The pictures shown on this page were taken in France in late April and West Wales in early May.